Lexington, KY – The basics of making beer don’t appear complicated. With some malt, hops, yeast, sugar and water, the beverage can come together in the novice brewer’s home kitchen in as little as three weeks. It seems as simple as following a recipe for chocolate chip cookies or a cheese souffle — until one meets microbiologist Gary Spedding. 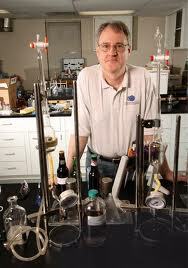 Spedding owns and runs Brewing and Distilling Analytical Services (BDAS) in Lexington, where he tests alcoholic beverages for anything and everything, ranging from alcohol content to bitterness level. His company’s work includes legal certification for brewers who, for example, might want to move their beer across state lines, but it can go far beyond that. Spedding’s analyses can also test for aspects such as lead content, mineral content, or the presence of sulfites, to name a few. The company’s comprehensive testing options have helped it to develop a very specialized niche, Spedding said. “We believe we are the only dedicated lab in the U.S. to provide this range of services,” Spedding said. Spedding didn’t just fall into his current career as chief beer tester. For six years, he taught microbiology at Butler University. Following his stint in a post at the Siebel Institute of Technology, as a senior chemist in beer analysis, he moved to Kentucky to do similar work for Alltech. When Alltech closed the testing division in 2003, Spedding started his own lab, BDAS.Like any niche, the beer culture has its own jargon that can be hard for an outsider to follow; when Spedding starts in on the “IBUs” and the “sulfur components” and “oxidation,” it can be difficult to ascertain if he’s still talking about beer. BDAS’s main facility is a huge, swanky, shiny, white lab with all sorts of equipment that measures everything from oxygen (“a big topic right now”) and alcohol content to bitterness (measured in those jargon-esque IBUs, or “International Bitterness Units”) to calories, among other things.